How do I place an ad onto the site? Does it cost anything to advertise? How long is my advert up for? How can I make the most of my ad? How can I change the advert after I have placed it on the site? What If I can’t take a picture of the Product? How to buy/ask about items for sale? How do I remove my ad once the product has been sold? Placing an advert onto the site is nice and simple. Step 1 is Registration/ Login- This is primarily a safeguard against the site becoming blocked up with Spam postings, which would just waste everyone’s time. You only need to register once, it is easy, free and will only take a few minutes. New users Register HERE, Existing users login HERE. Step 2 ‘Place an Ad for FREE’- click the button on the home page or HERE and follow the instructions. 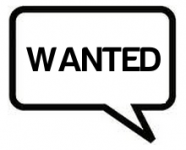 Please see below for a step by step video guide to posting your first classified advert. How is my privacy protected on buyandsellmobility.co.uk? As a Seller you are required to register and provide certain information. Your email address is attached to our secure contact forms, enabling a safe medium for prospective buyers to make contact with you. Please note: your email address will not be published/ visible on the site. Your Post code is the only information made visible, it gives buyers a rough idea of the area you are located in. Please note: your full address is never taken and so will never appear on the site. 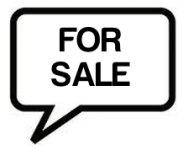 Some sellers however ,also choose to provide additional information in their adverts e.g their telephone number, this is the prerogative of the individual and not a requirement of posting on Access2. As a Buyer, your email address becomes available to a seller when you submit your enquiry via our secure ‘contact seller’ form. This enables the seller to respond to your inquiry. Excluding buyer inquiries, Access2 will never reveal your email address to any other party or show your email address on this website. No, it is absolutely free, you just need to be registered and loged in to place an Ad. This is primarily a safeguard against the site becoming blocked up with Spam postings, which would just waste everyone’s time. Registration is easy and free and will only take a few minutes. Register HERE to get started. You only need to login if you are placing or editing an advert. If you just wish to browse the website there is no need. The reason we require people to login is so that we can moderate what is published, i.e. people are accountable for inappropriate or misleading contributions to the website. As standard an advert is put up for 90 days. However, you are able to take this down as soon as the product is sold. You are also able to edit and extend your advert where required. There are lots of ways of making the most of an advert. The two key pieces of advice we give are to include good, accurate photo(s) and provide as much information as possible. This should also be presented in a readable manner which any prospective buyer will be able to easily interpret. Using the keyword function also helps your advert to be found on searches. The more of these the better, such as ‘warranty’, ‘reliable’, and ‘fast’, rather than just filing in the products specification. Changing an advert is very easy. Simply click on ‘My Dashboard‘ found at the top of the web page and select the advert you wish to edit. If you have any more specific questions please Ask an Expert. No problem. Just get in touch with us via our ‘Ask the Expert’, selecting Mobility Equipment Expert link and tell us what your product is and we will provide you with a library image to put on your ad. How to buy/ ask about items for sale? 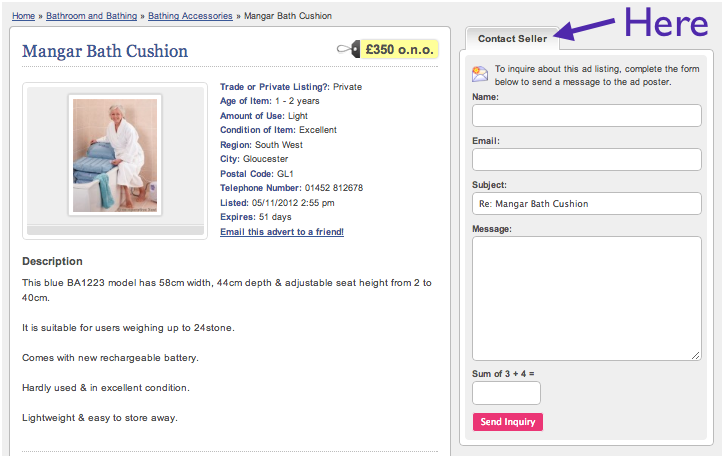 You can send a secure e-mail to the seller by clicking on the Ad, and filling out the ‘Contact Seller’ form located in the right-hand side column. This standard form will be securely e-mailed to the seller. Please note, you do not need to be logged in to be able to do this. Alternatively, some sellers may also provide a phone number within their advert. If you have forgotten your password you should first check your emails to see the original correspondence from Access2, which will contain your username and password. Failing this you should ‘ask an expert‘ and select website / technical help. Someone will be able to assist you within 24 hours. During the process of creating or ‘posting an ad’ you will get the opportunity to upload an image. Simply click the ‘choose file’ button (after the description section) which will then open a new window showing files from your computer. Choose the file containing your preferred image and then click ‘open’. The name of your chosen file will then appear, and you are then ready to either ‘continue’ to section 2 of posting your ad, or to upload a second image file. If you have any questions or experience any problems during this process please ‘ask an expert‘. Marking an Ad as SOLD is very easy. Simply click on ‘My Dashboard‘ found at the top of the web page and select ‘edit’ for the relavent advert. please change the header of the ad to say *SOLD* instead of pausing the ad. Thank you. Can dealers list ads on www.buyandsellmobility.co.uk? Absolutely! Our mission is create a highly focused marketplace that serves the needs of all those looking for mobility equipment be it new, used, private or trade.